Tremco Tremsil 600 sausage is a one-part, neutral cure, quick skinning, medium modulus silicone glazing sealant. 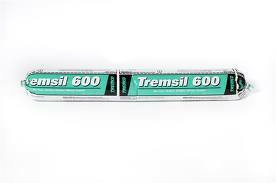 Tremsil 600 will cure to a flexible rubber when it becomes exposed to moisture that is present in the atmosphere. Tremsil 600 silicone is designed as an in-plant glazing sealant for applications that include, back-bedding, cap, heel and toe beads, and sash joinery. Tremsil 600 Is compatible with most common porous and non-porous building substrates and will adhere to aluminum, stainless steel, metals, glass, plastics, rigid PVCs, wood, brick, concrete and painted surfaces. This special slicone sealant is also used for application through automated glazing equipment such as x-y tables. Conforms to ASTM C 920 Type S, Grade NS, use NT, G, A and O and CAN/CGSB-19.13-M87 and U.S. Federal Specification TT-S-00230C (COM-NBS) Class A, and AAMA 800-92 (802.3-92, 808.3-92) and U.S. Federal Specification TT-S-001543A (COM-NBS) Class A.